Many of you are following my series on coffee grounds in the garden. Just to catch you up to speed, I used coffee grounds for my sorry looking roses, and they came alive. But conflicting information on the internet made me rethink my decision. Was I hurting or helping my plants? Read are coffee grounds friend or foe to find out. But what about using them for compost? “Coffee grounds are very acidic. So if someone (like a coffee shop) was composting mostly coffee grounds with some sort of bulking (brown) material, they might experience slower composting. This is because certain decomposers need certain pH ranges to live and if the pH is too low, some won’t be able to live there to break down the grounds. As for composting, Dr. Hepperly of the Rodale Institute indicated in my previous coffee ground article, compost should be one part green to three parts brown. To be honest, I didn’t fully understand the whole compost thing. You could easily call me a haphazard composter. I just throw in leaves and whatever comes out of my kitchen. See Cornell’s composting online fact sheet for more information. Want more brown for your compost? (No, not the UPS guy.) 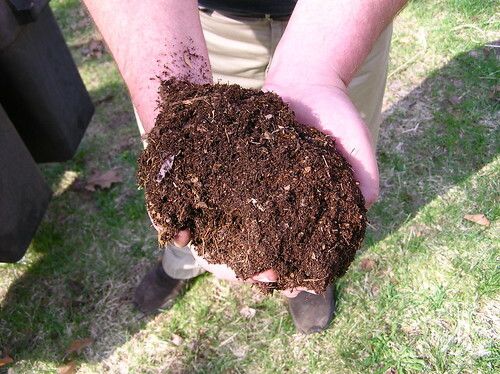 Read how to find and keep more brown for your compost. And for the green? Keep a handy composting pail in your kitchen. What Do Worm Think About Compost? The other day I dropped some green scraps in my compost to find a ton of small worms just lounging in the coffee. I never had so many worms before and thanked the coffee for my new visitors. So, I decided as I picked up another bag of coffee, a little coffee will do my garden good. Would you describe yourself as a lazy or methodical composter? Do you use coffee grounds in your compost? What makes your worms happy? I definitely put coffee grounds in our compost. I figure it is biodegradable, why would I not? But I’m a bit of a compost rebel. I’m more concerned that it stays out of the trash than it composts quickly! Thanks for the composting tips Anna. I’ve been throwing them in my composting bins for many years with great success. Thanks for sharing how to use coffee grounds for composting! These were very helpful tips! Wow, it’s nice know that we can use coffee grounds for composting. Thanks for the tips. I have had pretty good luck using composted leave around rose bushes. Maybe if you dried your coffee grounds out in the sun, they wouldn’t be so acidic. You could also mix them with lime. I keep a compost pail under the sink. since I looove coffee there are lots of grounds in there, but also banana peels, as well as other compostable kitchen scraps. Since I am a lazy composter, these are dumped every couple of days in the bin and turned into the rest of the materials. Since I have no grass, I take what my neighbors give me. Any other suggestions? If you add compost to your plants each year, how does that not begin to bury the plant in soil? Do you dig out some soil before composting? Thanks so much. I enjoy your blog! Fred, so should I just sprinkle alfalfa on the top? Every 2 months? I heard that comfrey does something similar. I use copious quantities of coffee grounds and kitchen scraps from our restaurant and dig it into shallow trenches on my farm. I call it ‘trench composting’ . That way I can prepare vegetable beds for the following year and I don’t have to move it twice and the digging is a good workout. I guess it depends what you mean by issues. I am growing organic/biodynamic vegetables in what use to be a very old apple orchard. I have voles, moles and mice, not to mention deer. The deer and voles cause the most damage. For now I am ignoring the little gnawing that happens on my potatoes. This relatively little damage and I the ‘trench composting’ could act as a distraction to the voles. I will be discing again this year (moving to minimal or low till in the following years). This should also act as a deterrent 🙂 I can’t bear to kill the little creatures. I have even bought some traps and will try that as well. Thank you for the helpful resource fron Cornell. I learned a lot from that comprehensive article and felt it covered enough as any class might. Much appreciation! I live in South Africa, and I use the “Bokachi” composting system, which works very well, and I love the Bokachi “juice” that is produced and makes the most awesome liquid fertilizer for surface or foliar spray. Only problem is the Bokachi accelerator bran is getting expensive. Is there any other way to produce the same breakdown effect with the kitchen scraps?